You are Dax Orrell, a Rebel scout stationed at Edan Base. Between patrols, you hangout in the landingbay, workingon your speeder bike. The docking hangar's intercom speakers crackle to life. "Dax Orrell report to the command center," they blare. "Dax Orrell to the command center," You pack up your gear and head off through the underground corridors to the base's heart. The command center is packed with Rebel officers. Captain Ellers is monitoringcomm channels and sensors, while Lieutenant Commander Kai is checking the shield generator's power output. Commander Drayson, your boss, is standing near a holographicdisplayofthe planet. You step lip and ask what he wants. "We need you to run a quick patrol," Commander Drayson says. "Olle of our sentries spotted an escape pod which crashed into the dense forest a kilometer from the base. I need you to go out there and see if there are any survivors inside." He gives you directions to the pod's crash site, then dismisses you. You return to your speeder bike and fly it out of the landing bay. Following Drayson's instructions, you zoom through the forest to the northeast. Soon you come to a small clearing: sitting in the center is what looks like an escape pod, with the main hatch wide open. You hop off the speeder bike and approach on foot to investigate. You decide to checkout the pod and its surroundings. You carefully check out the pod and its surroundings. The pod is nestled in a crater, probably the result ofa high-impact landing. Although the pod's hatch is open, you don't see any sign of survivors. You creep lip and peer inside the pod. It doesn't look like there's a lot of room inside. You might be able to fit one person in there, but he'd be pretty cramped and uncomfortable. Suddenly you hear a sound in the forest - something is humming and snapping through branches. It seems to be coming from the direction of your base. You walk toward the odd sound. Something is moving through the forest nearby. You're not sure if it's friendly or hostile. You feel it's best to sneak up and see what it is instead ofannouncing your presence to a possible enemy. You creep through the forest toward the sound. Sneak skill check. Attempting to silently slip through the forest. Careful of your footing, you manage to creep silently through the dense forest undergrowth. You spot something moving ahead and hide behind a bush. Peering out over the leafy top, you see a droid hovering in a clearing. It's an Imperial probe droid! You see it's main ocular bubbles focusing through a break in the trees - it's scouting out your Rebel base! Maybe it's too late, but you have to do something to stop that probe droid from revealing your hidden base's location to the Empire. You could sneak back to your speeder bike and fly off to warn the base. But that would leave the probe droid wandering around nearby. The Imperial droid must be destroyed. You draw your blaster and take a shot at it. To shoot the probe droid, you use your blaster skill, under Dexterity. 4D+2 The probe droid is not too far away -Medium Range - so this shot is a Moderate(15)difficulty. Roll your blaster skill dice. Your blaster burst hits the droid's main dome. Since your shot hit, you get to roll your blaster's damage dice of 4D and compare that to the droid's Strength of 4D. You've only nicked the droid. It turns and fires its own blaster at you: Your best bet is to try and dodge out of the way, The droid has a blaster skill of 4D. Dax's dodge has been improved to 3D+2. The droid's blaster shot hits you before you can get away-you're going to take some damage. To find out how badly you're hit, you'll have to roll the probe droid's blaster cannon damage of 4d+2. This will tell you how powerful the blast is. You've been wounded with a nasty shot in the leg. You fire your blaster, but the shot misses the probe droid. It targets you, turns its own blaster cannon toward you and takes a shot! The probe droid is going to shoot at you. The droid's blaster shot hits you before you can get away-you'regoing to take some damage.Tofind out howbadlyyou'rehit,you'll have toroll the probe droid's blaster cannon damage of 4d+2. You don't know how much time has passed when several Rebel soldiers wake you. A field medic is patching up your wound - it's not too bad. You warn the others about the Imperial probe droid, but it's long since escaped into the forest. You return to base quickly and report to Commander Drayson. If that probe droid was really scouting out your hidden base,you could have more trouble with the Empire very soon. End of "Escape Pod Down"
6 Rebels forced to work together. Captain Tulimus stood on the Havoc's bridge. His imperial Star Destroyer hung like a silent giant over the planet below. Behind him, officers and technicians in crew pits were working furiously at their controls. Several TIE fighters flew past the viewport as the Havoc maneuvered in to orbit. They had found no Rebel ships in the system, but were screening the Star Destroyer in case the Alliance tried to spring a surprise attack. An Imperial Army officer approached the Captain. Colonel Deers. We are orbiting Edan II, site of a hidden Rebel base and ... well, other objectives of Imperial interest.~ "Sir, I haveprepared mytroops for a ground assault ..... the Colonel began. Captain Tulimus raised a hand to silence the officer. 'That will be unnecessary." ~But. sir, our reconnaissance probe droid showed the base is protected by a shield. They also have an Ion cannon - should they choose to evacuate. we would have little chance of catching them." "I have taken care of that, Captain Tulimus said. "'We have a spy within who will ensure the shield is down and the ion cannon disabled when we begin our bombardment." "Should I prepare a small advanced force to move in once the shields are down?" Colonel Deers asked. "Perhaps asquad of troopers with an armed shuttle - they can bottle up any fleeing Rebels until the heavier assault equipment arrives'" Tulimus stroked his chin. "Very good idea, Colonel. Make sure they stay a good distance from the base at first. My turbolaser batteries will turn the target into a pile of rubble." "I will prepare an expeditionary force at once," Colonel Deers said. "Yes. Keep the rest of your troops on standby. They will track down any fugitives. You are in charge of all planetside operations. All areas of strategic importance must be occupied once we havedestroyed theRebel Base." Captain Tulimus dismissed Colonel Deers, then turned to a senior bridge officer. ~Target all turbo laser batteries and stand by. You will commence the bombardment on my mark." You are all members of the Rebel Alliance serving at a secret base on Edan II. You all believe in fighting the Empire, but it's hard and tiring work. Each of you has been assigned a bunk in the base's general cabins. Some of you may even be sharing a cabin with one of the other characters. After a quick bite to eat in the gaIley, you've turned in. Since you're always so tired, you have no trouble falling into a deep sleep ... Boom! You are all Jolted from sleep by a series of massive explosions. The base alarm siren blasts through every room. Commander Drayson's voice crackles over the intercom speakers: "Edan Base is under attack. All personnel must evacuate the base and proceed to rendezvous points. I repeat, the Empire is attacking. Evacuate the base ..."
The intercom is cut off by another explosion. You grab your belongings and stumble out of your quarters. The corridor outside is filled with base personnel running in every direction. The ground shakes with every new explosion, sending cascades of duracrete dust down from the ceiling. The Humination panels flicker on and off. What are you going to do? Gathering Supplies Before fleeing Edan base. the characters want to gather some supplies. The more resources they have, the better their chances of surviving will be. Since they've been stationed at Edan Base for a while, they know the best places to find supplies. The medical bay has a cabinet filled with medpacs used to apply first aid to injuries in the field. In the opposite direction, near the armory, are some weapons lockers which have blaster rifles. Grabbing Weapons The characters are heading for the armory area where they hope to find some weapons to help in their fight against the Empire. You race through the passageway toward the armory. When you arrive In the guard room, you find it deserted. The armory blast door Is scaled and locked - that'sgoingto takesome time to open, and you don't have much time. Looking around, you see a guardstation with a security locker nearby. You try the locker latch, but it's scaled with a keypad code lock. The characters might want to give up and try escaping to the docking bay (entry3)or out the back personnel entrance(entry8). lf they're determined to break into the security locker, they can use their brains or their brawn. Busting the Security locker: Moderate (15) brawling. A character might choose to force the lock open through brute strength. He can try breaking it open with his fists or might use a heavy piece of equipment. Have the character doing this roll his brawling or Strength dice. If the total is 15 or higher, he's broken open the locker. If the roll is lower. he can't bust it open. They find 3 Blaster Rifles (5d) and quickly pass them to those in need. The group then decides to head for the base's "back door, "the guard bunker. After their search for supplies, the characters are going to try and flee out the back exit, the bunker which guards an entrance into the base. Unfortunately. the Star Destroyer's turbolaser bombardment has taken its toll on the base, and many rooms and corridors have been blasted or have collapsed. Unlike before, you don't see any Rebels fleeing -some of them have escaped, but many were trapped or killed by the Imperial orbital bombardment. You run faster, hoping not to become another casualty of the Empire. You're almost to the rear bunker which guards the personnel entrance. You round a bend in the corridor and stop. A pile of stone and debris blocks the way out. A turbolaser blast must have caved in the ceiling. With the pounding the base has taken, you're afraid the corridor leading to the docking bay has collapsed, too. Walt! There, near the top of the cave-in, you see a small glimmer of light! This passage must lead close to the surface. If you could just clear away enough rocks, you could crawl through to freedom! Unfortunately, the passage is so narrow that only one character can climb the rubble and move away the large rocks blocking their escape. Clearing the Rocks: Moderate (15) Strength. The character climbing to the top of the pile must make a Strength roll of 15 or more to clear enough rocks away. Several stones clatter down toward the others. If the Strength roll is successful, a space is cleared wide enough to let one person at a time climb out. Grozharr quickly climbs to the top and attempts to clear the rocks. The characters emerge from the destroyed Rebel Base. You climb out into daylight and survey your surroundings. The base Is destroyed. You see nothing but turbolaser blast craters everywhere. Some explosions are still raining down near the docking bay. You decide to move off Into the dense forest before more turbolaser blasts finish off the base. You dash off into the dense forest, wary of another turbolaser bombardment. Peering up into the sky you see the white sliver of a Star Destroyer in orbit. Several points flash green, turbolaser bolts which rain down on the base, blasting the ruins with every hit. "Halt right there!" Off to one side Is a squad of four white-armored Imperial scout troopers. They're picking their way through the dense forest undergrowth, trying to catch up to you. "Stop those Rebels!" their commander shouts. The troopers open fire. 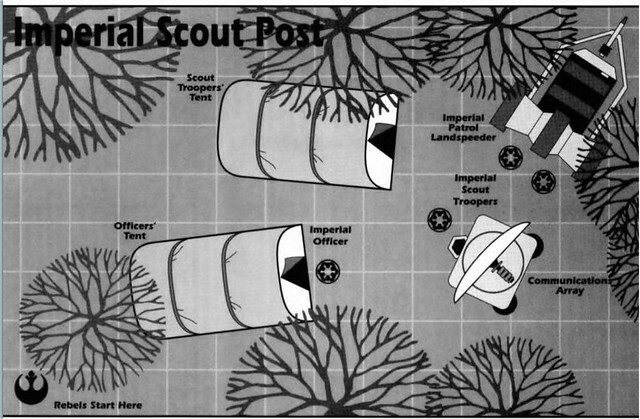 4 Imperial Scout Troopers.All scores are 2de xcept: blaster4D, dodge 4D, Mechanical 3D, gunnery 3D+2, repulsorlift operation 3D+2, brawling 3D. Speed 10. Equipment: blaster pistol (40damage), blaster rifle (50damage), 2grenades (5D damage, hits 1D targets nearby), scout armor(+2 to Strength when resisting damage), survival gear. Did the Rebels win the battle? The climactic battle with the Imperial scout troopers brings Assault on Edan Base to a close. You've finally defeated the Imperial scout troopers sent to capture you. There could be more ground patrols lurking near the ruined base, so you decide to move farther into the dense forest. You peer back toward the smoldering remains of Edan Base. It's no use going back there-the ruins will be crawling with Imperial troops soon. The white sliver of the Star Destroyer still hovers high above the planet. Your best chance Is to hike through the forest, looking for a settlement or other escaped Rebels. It's not going to be easy surviving out here. You know the forest is home to some pretty dangerous predators, like the fierce snowcats. And with that Star Destroyer In orbit, it's a sure bet the Empire will be sending more ground troops here. Maybe they're looking to round up stray Rebels. Or perhaps the Empire is on Edan II for a much more sinister purpose. Corsair cursed as his fingers blurred over the X-wing's flight computer. The base hangar's ceiling trembled again. As several suspended conduits buckled, dust rained down on his starfighter's canopy. Corsair glanced upward. The hangar bay was littered with debris, but his launch path was still clear. If he could just get the engines warmed up ... Six TIE bombers (lying in standard echelon formation screamed over the Edan landscape. The Rebel base, already crippled by the orbital bombardment, had ceased resisting early in the siege. Now the Imperials knew the Rebel vermin would flee their nest and scatter into the wilderness. That was there action the TIE bombers were to stifle. The lead ship roared forward and issued commands to its escorts. "Omega group: ten seconds to target. Synchronized drop on my mark." The X-wing was silent in the desolate hangar bay. Inside, Corsair was hoping for an engineering miracle, Without an R2 unit in back, the ship couldn't reroute his commands around the damaged components. He yelled, punching the flight computer in complete frustration. The panel sparked as two sundered wires deep within the computer connected with the force of the impact. The engines immediately started to cycle as Corsair cheered in triumph. Then he looked out of the cockpit - a tight formation of ships was flying extremely low, directly toward the base. Corsair fidgeted as he waited for the engines to build significant power to launch. The six TIE bombers soared over the last rise before Edan Base. As the landscape blurred beneath them, the targeting computer in each starfighter beeped twice in unison. The first ofthe shimmering spheres dropped from their bomb bays. The engine meter crept upward at an agonizingly slow pace. Corsair glared at it, hoping that his will alone could influence the physics of the ion drives. Then he heard the roar of the TIEs overhead, and the unnerving whistle of multiple objects dropping from above. "Close enough," he mumbled, and jammed the X-wing's throttle to its farthest forward position. There was a roar behind him. As his ship shuddered under the sudden and premature acceleration. he saw the hangar bay begin to recede behind him. The first high-yield proton bomb struck the back of the hangarbay. The other volleys followed, walking explosions across theonce-proud Edan Base. As if it had a last request. the base spat out a lone X-wing fighter, which immediately banked hard and rocketed away from the dying base. Gasping for breath, Corsair checked over his shoulder at the terrain swirling beneath him. He had to clear this area fast and put down before the orbital energy scanners could react to his launch. As he set a course, he thought he saw several groups of foot soldiers running (rom their former home, diving for cover in the lush Edan forest. Given their variety of uniforms, they could only be Rebels. Good luck, he silently wished them, and see you at the Rendezvous Point. You gaze through the fading mist of your own breath into the Edan night. It's cold; cold and eerily silent on the edge of a deep forest. The pristine atmosphere of Edan II - unmolested by industrial pollution - lets the stars shine in perfect clarity. As you look up to the myriad of distant suns, and the war which you know is occurring between them, you wonder if you'll ever be among the stars again. It has been four days since the Imperial siege of Edan Base. Once the main generator collapsed under a power overload, the Empire easily decimated the fragile outpost from high orbit. The base's ion cannon barely managed a single shot before being silenced by the orbiting Star Destroyer's turbo lasers. Meanwhile, the Rebel Alliance's fighters were the first craft to fall from the sky - if they weren't buried in the collapsed hangar bay. Any shuttles and transports which managed to escape crashed into unyielding rock or disintegrated in mid-air. It was a desperate hour for the Alliance. You and your friends managed to escape the base and flee into the surrounding wilderness. The retreat was chaotic at best. You have no idea if any evacuation teams survived. For the past few days you've been putting as much distance as you can from the fallen base, knowing that the Empire would establish a tight net of guard posts, speeder patrols, and fighter escorts in an attempt to catch escaping Rebels. So far, you still have your freedom however, without star craft, speeder bikes, or major weapons, your freedom is about the only advantage you have. The sky slowly changes hues, lightening from a midnight black to a deep blue. The dawn is corning - and with it another day of survival on a lonely world. You've heard of major settlements on this continent and the one that lies to the south. With any luck, you'll find fuel and weapons, spare equipment, and Rebel sympathizers there. You heard Commander Drayson mention five rendezvous points scattered around the planet. Perhaps your fellow Rebels are waiting for you at one of them. But there will be no escape as long as that Star Destroyer is in orbit. In the deepest part of your mind, you know that you'll have to deal with the Imperial Star Destroyer Havoc before you can leave this world. The faintest crest of the sun rises over the eastern mountain range, and the chirping of a hundred Edan birds begins to fill the silence. Right now the characters believe they're alone. While they're breaking camp and discussing their plans for today. four ravenous Edan tigers or snowcats are stalking them. Dax did not notice anything. Morgana notices several monstrous beasts. White and black stripes blending into the morning twilight. Huge fangs with cruel, lifeless eyes. Growling sounds and branches to rustling can be ever so slightly heard. Morgana warns the others! Did the Rebels defeat the 4 Snowtigers? They slowly calm down after the surprise conflict and begin to ponder their next move. You have only seen the orbital map of Edan II a few times, and it's impossible to recall any intricate details. However, you do remember that the planet's surface is divided into two main continents, separated by a large expanse of ocean. Edan Base is on the northern continent, which is roughly oval in shape. There are two major colony efforts on this continent. One- Fortuna City - is on the far eastern shore. The other is in the southwest comer of the continent. The other land mass wraps around the first continent, along it's southern and eastern edges. Edan Base is nuzzled in the northern rolling hills, making the colony on the eastern shore closer by at least 1,000 kilometers. You also recall a Rebel rendezvous point in that area, in addition to the other four spread across the planers surface. The group nearly unanimously decide to head towards Fortuna City - on the far eastern shore. You crouch instinctively as you hear the familiar sound of a repulsor lift engine. From the sound of the device, It appears to be some sort of transport. The engine noise dims, as though It has stopped moving and is now holding its position. Then you hear several booted feet moving up and down on a metal ramp, along with the sounds of equipment being off-loaded. You try to get a glimpse of the action, but the lush green underbrush prevents any kind of view. Whoever it is, they're not far off. Behr approaches the border of the encampment undetected. Behr returns and conveys the details to the group. He crudely sketches out the camp. He explains it's an Imperial scout post. The encampment seems little more than a mobile comlink station, two tents, and a few speeder bikes. This forward post is probably being established to help search for escaping Rebels. He can only see 3 Scouts and 1 Officer. The team agrees on Behr's plan. He and Dax will sneak to the rear of the Northern tent, once in place Behr will lob a grenade towards the Communications Array in hopes of catching the group off guard, drawing out anyone in the tents, and damaging the array to prevent any calls for backup. Pratt and Grozharr will come from the middle with Grozharr looking to melee anyone coming out of the tents. Morgana and Anson will move in from the south concentrating blaster fire on the central group and giving cover fire for those moving into melee range. Dax is spotted prior to the group being in place. The element of surprise is lost. Dax is not in place and will not be in the beginning of the battle. Do the Rebels win the fight. Grozharr was injured as 2 unseen Imperials appear from inside the tents. 4 Scouts and 2 Officers. The fight continues, Dax joins the fight. Do the Rebels win the fight? Grozharr is able to take out both an Officer and a Scout. Grozhaar clubbed the Officer with a mighty blow to the head and stopped a fleeing Scout with his bowcaster. Behr yells out "Gather any valuable equipment and supplies! Look for clues about the Empire's plans for Edan II. We've got to move fast!" In the Officer's tent: Items found include: Datapad with included a map of Edan II, an officer tunic (Lieutenant rank), Keypad Locked storage locker. Dax moves to see if the Communications Array was damaged during the firefight? Dax "Well, that's a shame". He then joins the others surveying the landspeeders. The dull·blue landspeeder has been redesigned for planetary patrol. It is well-armored, and its three repulsorlift engines are tucked within the protective chassis, A light repeating blaster rests upon a mount on the forward hood. There are rudimentary targeting controls in the front passengerseat. The entire vehicle is in good condition, including the prominent "Imperial Patrol" insignia on both sides of the vehicle. Pratt, the Brash Pilot, pushes through the others and jumps into the driver's seat. "Let's go Groz!" Dax looks towards Behr but Behr knowingly shakes his head and lips "Let it go". Then Behr leans over and removes the Imperial Patrol insignia. To start and perform basic maneuvers requires an Easy (10) repulsorlift operation. Pratt's check. Pratt fires the engines, Grozharr drops into the front passenger seat. Most of the others cram their way into the remaining seats in the back. Anson attempts to use a Medpac to improve the state of Grozharr's wound. Easy (10) required. As soon as he finishes he makes his way to the back. The group is all probably the happiest they have been since the base was attacked, however they haven't thought through the situation. The patrols that left will be returning to the base and will soon inform others of what has happened, and finally will begin their pursuit of the slower landspeeder. After a few moments of peaceful interlude, have all players make a Moderate (15) Perception check. Behr glances backward... the lush Edan trees blur past your landspeeder at a comfortable pace. You glance backward, and are surprised to see two white dots following you through the forest. Looking closer, you realize that they are Imperial scout troopers riding speeder bikes! And they're closing in! You scream over the din of your own repulsorlift engine to the pilot. You're not an Imperial tactician, but it looks like they're closing to weapons range.